On June 11, 1719, colonial official, attorney and judge Tobias Knight died. While he appears in North Carolina records as early as 1710, it wasn’t until two years later that he figured prominently as the secretary and collector of the colony. He soon was beset by a series of scandals. The first came when Knight was accused of stealing from the Church after refusing to repay a debt, which Governor William Glover had accrued and which many felt was Knight’s responsibility on behalf of his wife, Catherine Glover Knight. Catherine was Gov. Glover’s widow. A more significant scandal came later, and involved the notorious pirate, Blackbeard. After Blackbeard’s death, some of his slaves were tried in Virginia. They testified that Knight had worked with the pirate. Charged as an accessory to piracy, Knight was tried in 1719. As an attorney, he spoke on his own behalf and convinced Governor Charles Eden and the council of his innocence. 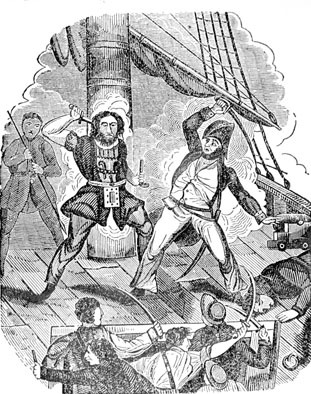 In spite of that, Knight resigned as the colony’s chief justice and was accused again, this time along with Governor Eden and others, of collusion with pirates. Before he could be investigated further, Knight died after a long illness.